Animal sanctuaries - what role do they play in conservation? Are they the best solution or the last ray of hope for an exotic animal like a lion, tiger or other big cat? 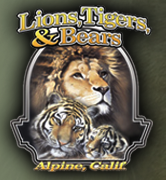 I recently had the opportunity to visit Lions, Tigers & Bears, an animal sanctuary in Alpine, near San Diego, California. Speaking with owner Bobbi Brink, I learned more about what a good animal sanctuary does and does not to do for the animals within its care. First, it's important to understand why animal sanctuaries exist in the first place. While I am fascinated by the beauty and grace of exotic cats like tigers and jaguars, I have no desire to keep one as a pet. However, there are others who do for reasons of status or an inflated sense of macho dominance. Whatever the reason, there are black market suppliers who are bringing in wild animals or raising them just below the radar of government officials and selling them to the highest bidder. From there, owners eventually discover that an exotic cat can become a handful, either because of its size as it matures or its nutritional requirements or temperament. Eventually the animal ends up in an abusive situation because of a cramped and confined living space or malnutrition or physical abuse from a sadistic owner. Sometimes these animals are given over freely to an animal sanctuary and sometimes they are offered by law enforcement who have confiscated them but have no means to care for them. In either case, the choices left when such a point is reached are two: animal sanctuary or euthanasia. Because of the length of time having been out of the wild (or raised entirely in captivity) and the amount of human interaction these animals have had, reintroducing them back into the wild is out of the question. Somewhat surprisingly, zoos can also be another source of animals bound for a sanctuary. Zoos can find themselves with excess animals through animals naturally mating. If other zoos are not in the market for that particular cat species, then a zoo may have one extra mouth to feed that it can ill afford. Also, there are smaller zoos (and I use the term loosely if you think of a zoo as a properly sanctioned and regulated organization) and circuses that can find themselves economically hard pressed to care for large, exotic animals. Sometimes, in the case of bears or mountain lions in Southern California, man's encroachment into their territory can produce a situation where an animal is no longer afraid of humans or urban environments. When an animal wanders into a neighborhood, is caught by local officials and released back into the wild but, because of its lack of fear or its growing need to find food, it keeps returning - wildlife officials are often faced with having to put the animal down. Unless there is an animal sanctuary available to take it in. In many ways, sanctuary owners would like nothing more than to be put out of business because of a lack of animals who need protection. But, unfortunately, as long as the profit motive is high and the egos of some people are great, combined with the economic realities that zoos and circuses can face like any other business, there will always be a need for the animal sanctuary as a place where these special animals can live out their lives comfortably. At Lions, Tigers & Bears, there are currently three lions, four Bengal tigers, three black bears and several smaller exotic cats on the property. They are provided with large, comfortable cages for eating and sleeping with much larger fenced areas for exercising. To provide stimulus, the cages are interlinked so that the cats' access to the larger exercise areas can change every couple of days. Having suitable space is important. Bobbi's latest addition to the sanctuary is the bear enclosure which is nearly the size of a football field for just three bears. About ten feet out from all the cages and surrounding the animal pens is a secondary fence nearly 20 feet high. While Bobbi has a full veterinary facility and a staff of volunteers who prepare and feed the animals a balanced and nutritious diet, contact with the animals is kept to a minimum. No one on the staff, including Bobbi herself, ever attempt to engage in physical contact with the animals. The animals may recognize members of the staff and approach them within their enclosures, but you won't see Bobbi or her staff throwing their arms around a tiger and giving it a belly rub. Most sanctuaries frown on that kind of human contact. Having gushed to Bobbi about my love of tigers, she agreed to take me and the film producer I was with inside the outer perimeter fence to get a closer look. One of the female tigers approached, expecting a treat which Bobbi had in the form of some cut up chicken. I remembered all of my big cat rules: no cologne or after shave, no sudden moves, and no staring eye-to-eye. I was absolutely amazed at the manner in which this beautiful 300-pound tiger moved, but she barely tolerated my presence and several times let me know with a hiss and a healthy roar. Visitors are limited at Lions, Tigers & Bears to small, supervised groups that must be arranged in advance and people are normally kept at a distance, outside the tall perimeter fence. This still affords visitors the opportunity to see these animals in a more relaxed and comfortable setting, different from what one sees at many zoos or commercial animal parks. By limiting the number of visitors as a revenue generator, as a non-profit organization, Bobbi is always on the prowl (pardon the pun) for funding. Lions, Tiger & Bears will be holding an annual fund raising event in May, but right now Bobbi is on the road, working with other animal sanctuary owners in promoting changes to existing legislation - in particular, HR 4122, an Amendment to the 1981 Lacey Act - to tighten the rules and regulations regarding the private and commercial ownership and care of exotic animals. I will bring you more information on the planned fundraiser and an interview with Bobbi that she and I talked about as soon as she is back from the road. Properly run animals sanctuaries like Lions, Tigers & Bears (the sanctuary is accredited by two leading national and international animal sanctuary organizations) provide animals, who have been unfortunately stripped of their connection with the wild, with the opportunity to live out their lives in dignity, good health, and peace. Passionately committed people like Bobbi Brinks wish it didn't have to be so, but the alternative would be abuse or a premature death for an innocent and magnificent animal.